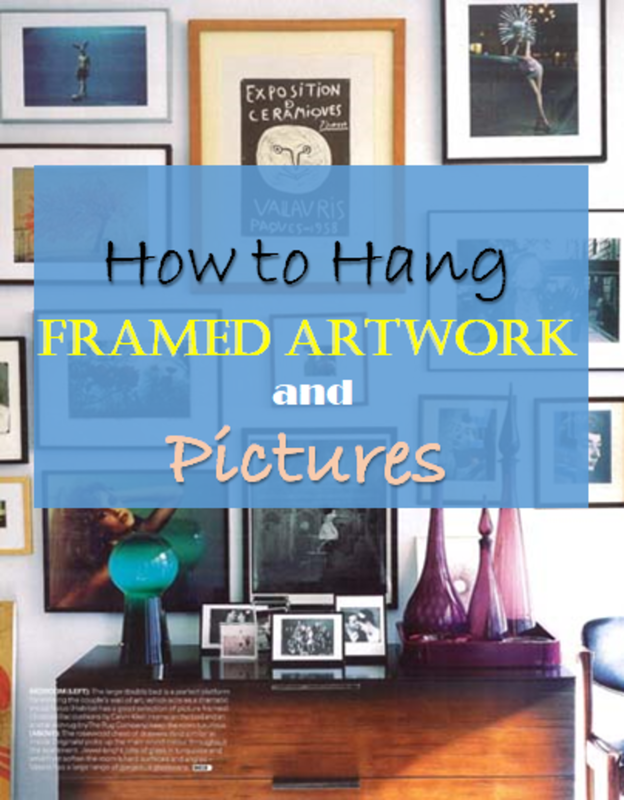 There are many creative ways of hanging artwork and framed pictures on your interior walls. While wall art must look organised whichever way that they are arranged on a wall, there is no hard and fast rule as to how they should be laid out. Interior designers and home decorators can usually tell the types of artwork that go well with the themes of their interior projects and are quite adept at arranging art in aesthetically pleasing and effective manners. But you can too, because there are no rules cast in stone on how to hang art. There are a few basic principles that represent what is desirable to different people, however. Size of the wall: Your wall size will determine how you hang wall art. If you have a narrow wall with a low ceiling, for instance, you don’t want to hang an overtly large painting that swallows up the wall. Shape of the wall: If you have a triangular wall (typical wall shape found in A-frame homes), or a square wall, you will hang artwork differently on the two walls. Wall height: For interiors with high ceilings, for instance, you want to hang paintings that are proportionally balanced with the wall’s character. 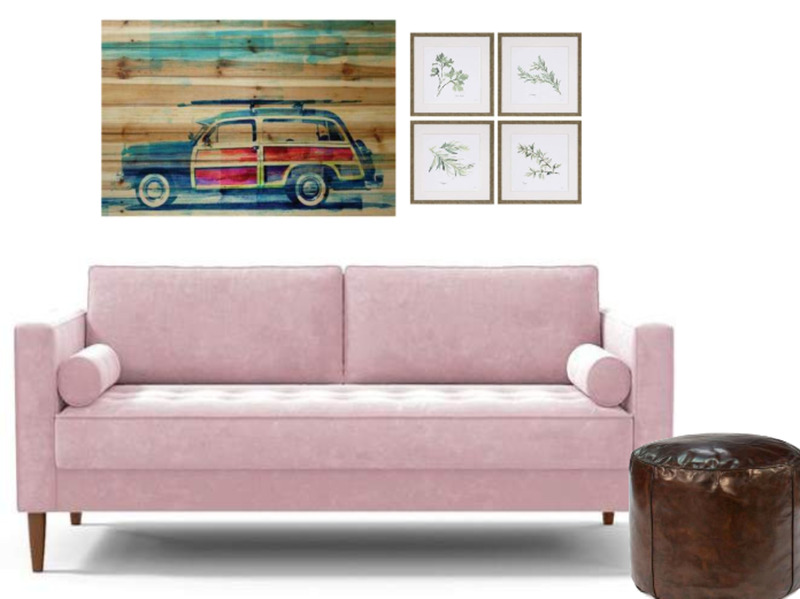 You don’t want to install a couple of small framed artwork that will visually disappear on high walls, neither do you want to hang an oversized wall art on low walls. Position of the wall: Awkwardly positioned walls can be a bit tricky. The best way to decorate such walls, for instance, walls of a niche, is to go the gallery arrangement way. 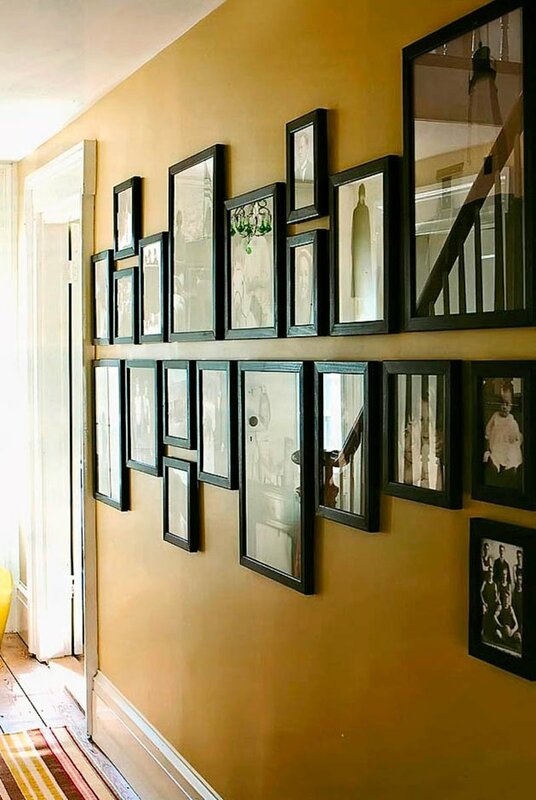 You can extend the gallery of small framed pictures into the corners to help the stark lines of the niche appear to disappear. Available wall space: How much wall space is available for hanging your artwork? If, for instance, you live in a tiny apartment and can’t seem to find space for your art, hang your art as a column of art that spans from below eye level to above eye level, about 2ft away from the ceiling. Ensure they are the same small-sized framed works. Backdrop or a feature wall: If you don’t have a feature wall, you can create one with wall art. Depending on the size of the wall, you can go for a one-piece framed art, a standalone tapestry, or a series of artworks like a collage of art or a collection of framed black and white or sepia photographs. Colours/style/size of picture frames: The picture frames come in all conceivable colours, and different styles and sizes. Depending on the design theme and the interior colour scheme, you can base your choice of frame style on anything that ranges from the vintage-inspired to the modern type picture frames majorly made from man-made materials. A simple minimalist look - A 2-art wall hanging idea that also works as a backdrop for the piece of furniture. Picture Hanging Ideas: Symmetrical or Asymmetrical Arrangement? Many homeowners feel much more comfortable using a symmetrical picture hanging arrangement. They think it is safer to keep within the conventional ways of hanging artwork and there is absolutely nothing wrong with that. 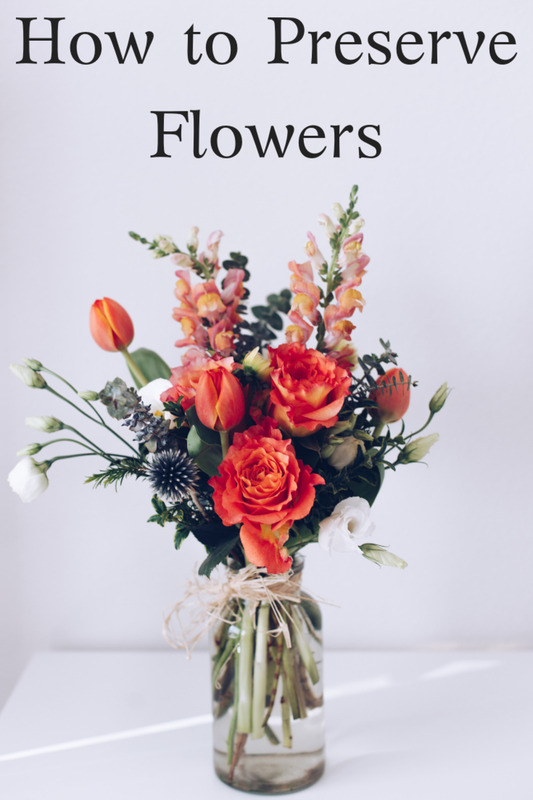 But you can also go for an asymmetrical arrangement if you want something unique and different from the norm. 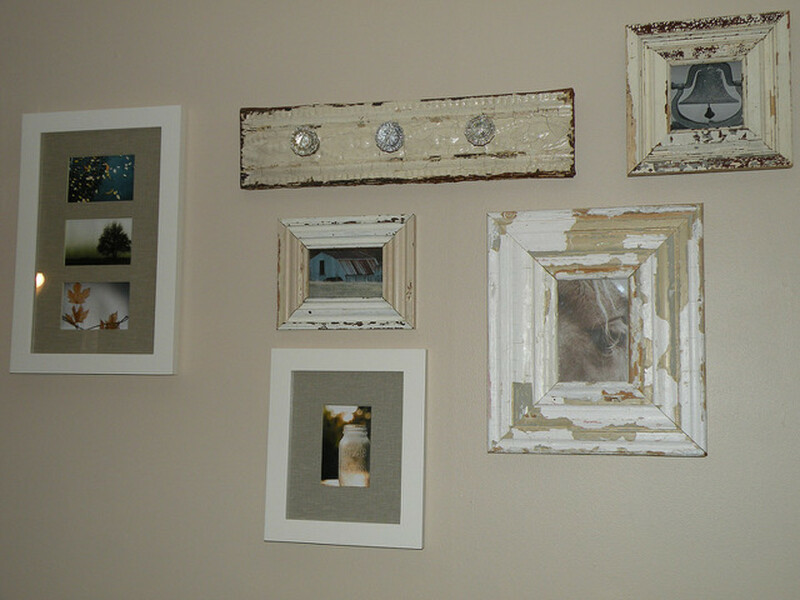 An asymmetrical arrangement includes using different sizes, styles, and colours of picture frames, all arranged haphazardly on a wall. For wall art to stand out conspicuously within the room's decor, it's best to have plain neutral wall colours. If you must have striking vibrant colours, let them be a part of the artwork. 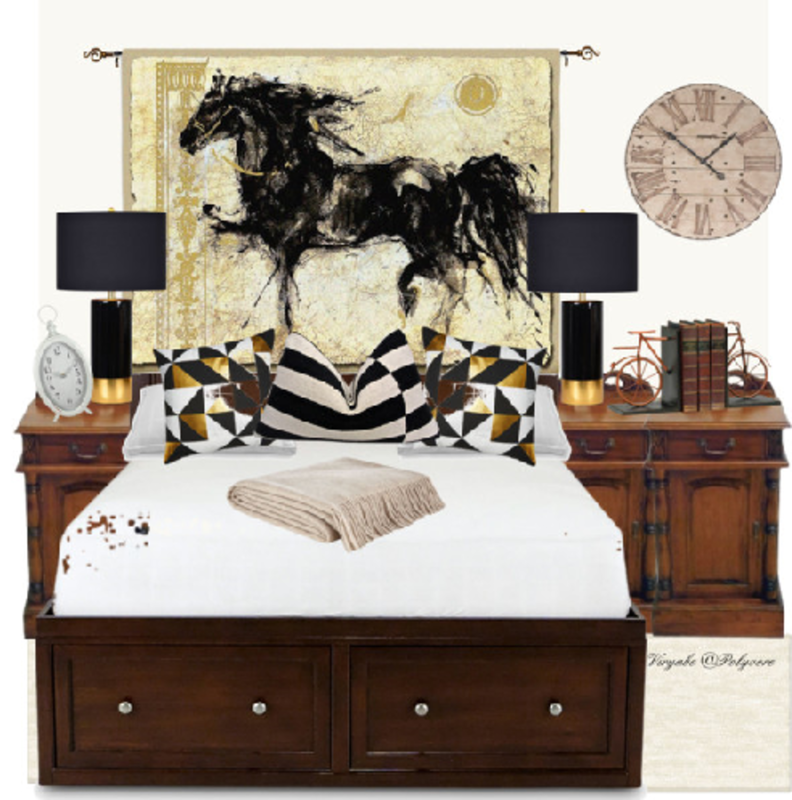 It is best to relate the subject matter of the artwork to the character and theme of the room. Create colour accents on one wall with framed paintings or photographs. Use different colour frames for each picture with different colour frames. 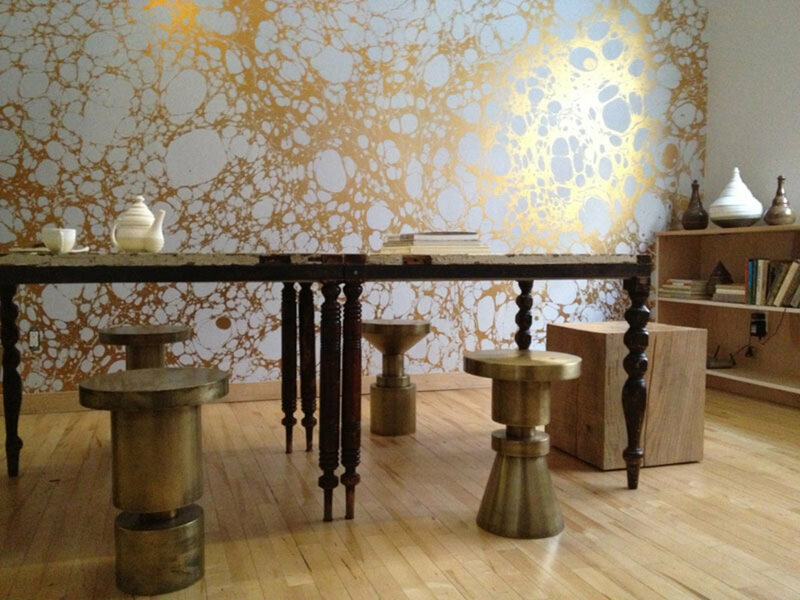 This can be a feature wall that is set in harmony with the general interior design. Symmetrical picture hanging arrangements, all hung in geometric patterns. 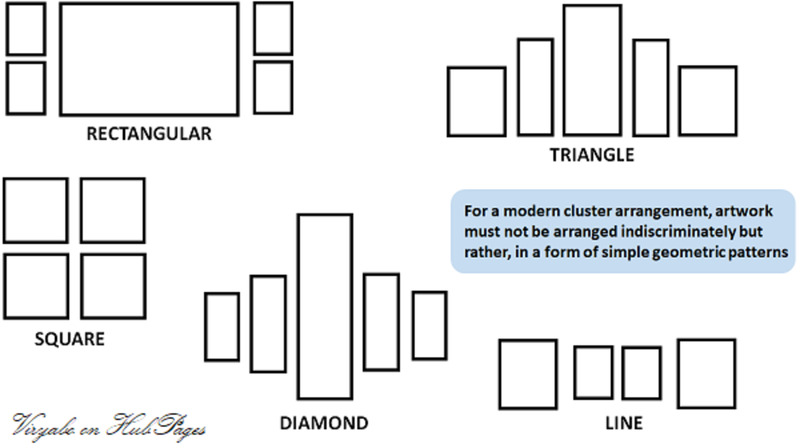 For different themes, shapes and sizes of art hung on one wall (posters, pictures, photographs, wall art), set them close in a mass arrangement. This makes the entire wall look like a beautiful scenic view. Hang one large painting on the most significant wall in a room. At times, interior walls with too many artworks can be stressful and heavy on the eyes, especially if they have ornate frames. If you have rooms with heavily decorated walls like scenic images, patterned wallpaper, special paint effects, wall murals etc., do not hang framed art on them, because the paintings will end up being totally lost in the busy background. This picture hanging idea has a nice symmetrical arrangement that works as a backdrop for the sofa. A simple and eye-catching layout. A creative way to hang a standalone tapestry art, making it serve not only as a piece of decoration, but also as a faux-headboard. A one-piece wall art must have at least one of its stronger colours repeated in the interior decor of the room. 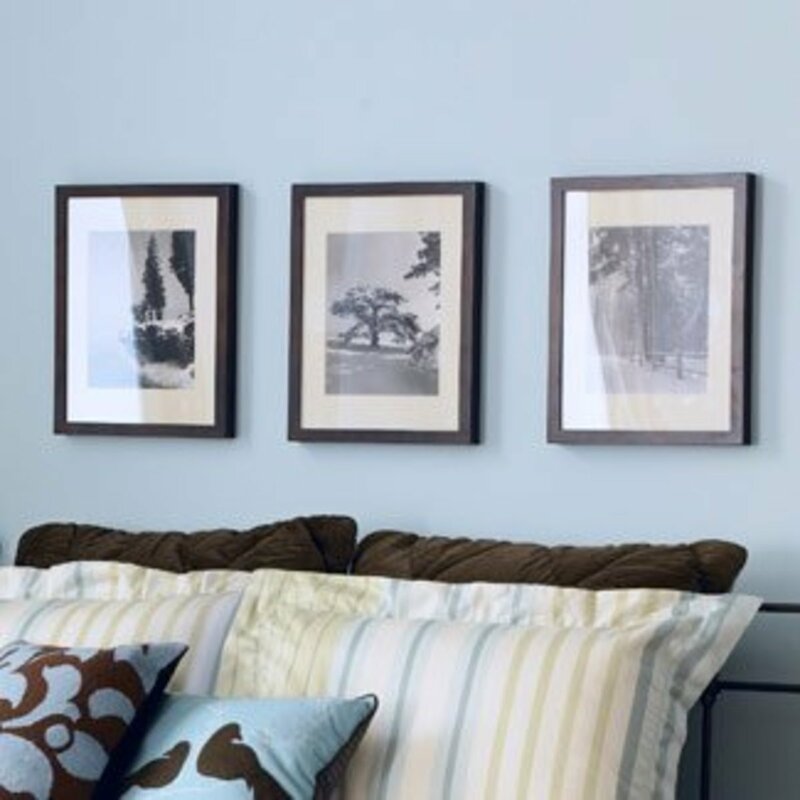 A simple picture hanging idea using three framed pictures/paintings, all set out in a straight line. Groups of three pictures could either be hung with the largest in the centre or two of the same size on both sides of the third. It is good if the three artworks are related in character and colour scheme. Small pictures look better when hung at eye-view level. Larger paintings that will be viewed from a distance are best hung at a higher level. A group of artwork arranged asymmetrically can be placed on wall surfaces that are not a central point of the room. Make sure that hanging artwork ropes or wires do not show when paintings are hung on walls. It looks so tacky when hanging elements become obvious. Do not hang oil paintings and watercolour paintings in close proximity. 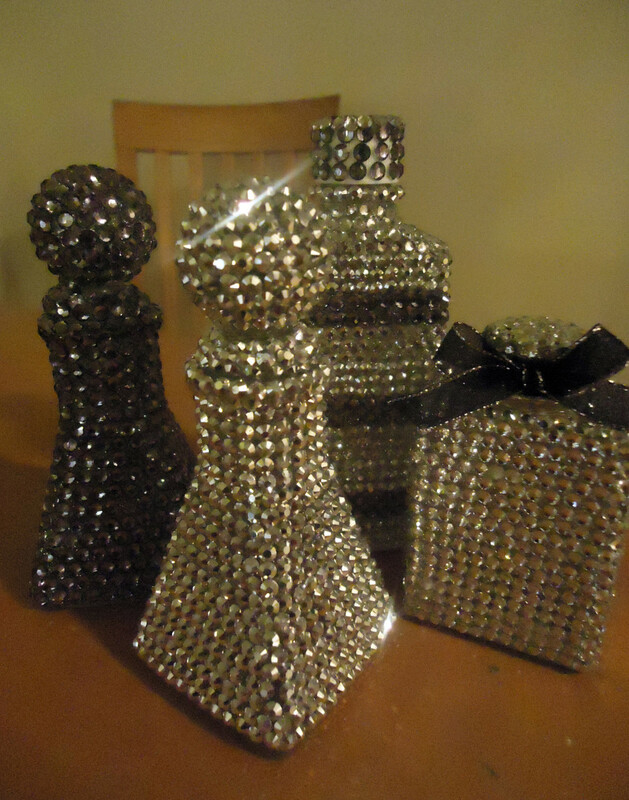 It will become inharmonious unless they are similar in colour tones. Hanging artwork with vibrant colours next to black and white sketches is inappropriate. They must not be placed close together on the same wall to avoid a situation that's odd and inconsistent with picture hanging styles. 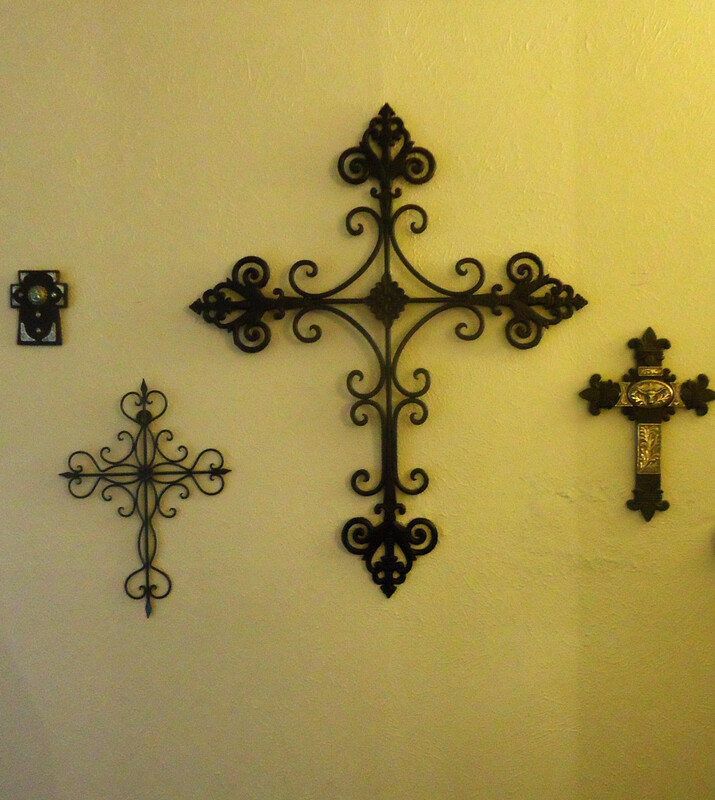 When you hang wall art, which type of arrangement do you prefer? Great article. As a photographer I always want to come up with interesting ways to hang my work. Thanks ignugent, and thank you for visiting. Thanks Angel, i appreciate your visit and nice comments. 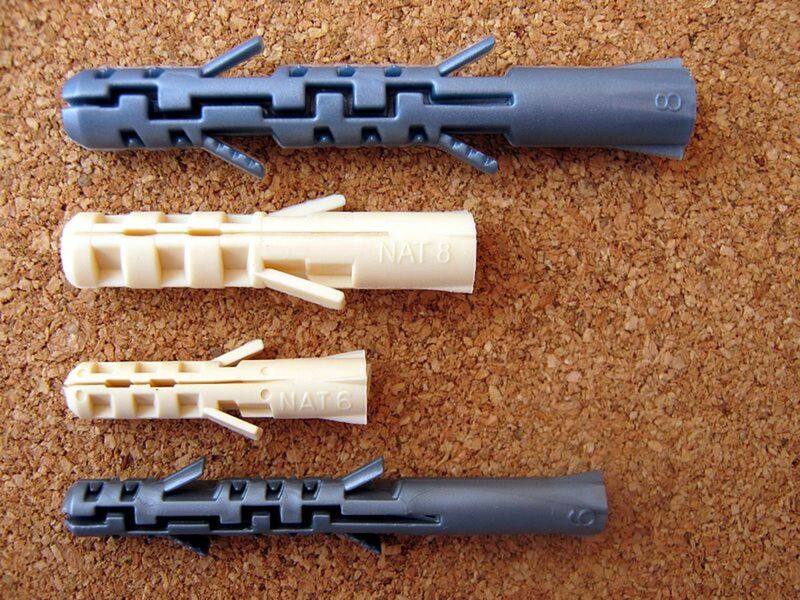 Excellent hub with some great tips. Thanks for sharing.